Dr. Hatakeyama was an undergraduate student at Waseda University in Tokyo, Japan, where he graduated with a Bachelor of Science in Physics in 1996. He earned also his Master's degree from Waseda University in 1998. He then joined the Rockefeller University, and earned his Ph.D. in Physics in 2003. He served as a postdoctoral research associate at Rockefeller University until 2009. 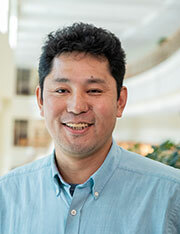 Dr. Hatakeyama joined the Baylor faculty as an assistant professor in the summer of 2009, where he continues his research in experimental high energy physics (HEP). Dr. Hatakeyama's research is in experimental high energy physics, and has worked on the CDF experiment at Fermi National Accelerator Laboratory, Illinois for about 15 years with an emphasis on precision measurement of Quantum Chromodynamics (QCD) and searches for physics beyond the standard model. After coming to Baylor, the focus of his research moved to physics with the Large Hadron Collider (LHC) at CERN, Geneva, Switzerland. He worked on making a Baylor high energy physics group as a member of the CMS experiment, one of the major experiments at the LHC, and Baylor became an official member institution of the CMS experiment in summer 2010. Since then, the Baylor group has been conducting research with the CMS experiment vigorously and worked on several searches for Supersymmetry (inclusive Supersymmetry searches in the multijets + large missing transverse moment final state and Supersymmetric top quark search in all hadronic channel) and precision QCD measurements. The Baylor group has also made a significant contribution to establishing hadron calorimeter detecotor performance studies, simulation, and upgrades. From 2009 to 2010, he led the data quality monitoring and physics validation of jets and missing Et in the CMS experiment, and from 2011 until 2013 he served as a convener of the CMS MET working group. From 2013 until 2015, he led the CMS SUSY future analysis group. He was a CMS LPC senior distinguished researcher in 2013 and 2016. Currently he serves as a CMS hadron calorimeter data performance group co-leader, and preparing for the data collection in 2018 and beyond with the evolving CMS hadron calorimeter system.